The Garmin Forerunner 620 is the complete runner’s tool. Perfect for serious runners and marathon personal best chasers, it’ll tell you everything you need to know to improve your running performance. As you'll read in this Forerunner 620 review, standout features include real-time heart rate monitoring, albeit with a separate chest strap, cadence and vertical oscillation stats to help you strive for a record-breaking Mo Farrah running style, and it’ll even offer advice on how long you need to recover from the workout you’ve just done. Add to that a great battery life and a responsive colour touchscreen and you’re looking at one of the best running weapons you can put on your wrist. Out of the box you'll spot that the Garmin Forerunner 620 is a high-quality package – the circular watch face is a decent size for visibility, but far from the enormous wrist-weights of yesteryear. The colour touchscreen is responsive and easy to navigate even when you’re on the move. It's lighter than its predecessor (the 610) by a considerable margin. Included in the box is the heart rate monitoring chest strap – vital for tracking that vertical oscillation – and a proprietary charger that's not compatible with any of your older Garmin watch models. While having a unique charging cable isn’t something only Garmin’s are guilty of, it’s irritating having to remember to take this with you, especially if you’re a commuter runner who might want to leave work with the Forerunner on a full charge. The Garmin Forerunner 620 has one of the most complete suites of tech on the running watch market, packing in everything from Wi-Fi to ANT+ to Bluetooth Smart, and this is used to deliver some neat tricks. One particular piece of ingenious design is the fact that it will automatically cache satellite locations so GPS acquisition is considerably faster. In our tests we got a GPS signal within 30 seconds on almost every outing. The cache is updated via Wi-Fi and Bluetooth Smart each time you connect. The Garmin Forerunner 620 is waterproof to 50 meters, but won’t track your movements in the pool, sadly. Luckily, its performance on terra firma more than makes up for it. Unsurprisingly, the range of activity tracking that the Garmin Forerunner 620 offers is immense. By default you’ll be tracking pace, distance, time and heart rate, but these are all configurable, and like other high-end training watches you can choose precisely which metrics you’d like on a series of up to four screens or pages. On the move a simple tap of the touchscreen skips between the screens. As we mentioned, the GPS caching trick means locking onto satellites is usually a matter of seconds rather than minutes, and accuracy is excellent. The Garmin Forerunner 620 also introduces some new features: VO2Max Check: to tell you the current state of recovery and Race Predictor, which will tell you how quickly you could run your next race. In addition, when you’re using the HRM-Run heart rate chest strap you’ll get access to Running Dynamics metrics such as cadence (the rate at which your feet strike the floor, 180 strikes per minute being somewhere near ideal), vertical oscillation (the total vertical movement of your torso) and ground contact time (the amount of time your feet spend on the tarmac or trail). This is a previously unseen level of detail about your running style and efficiency that might be a bit too much for a fun runner but offers extremely useful insights for the serious runner on the search for perfect form. You can also set up in-run alerts for everything from time, distance, pace, heart rate, cadence and calories, while a run-walk alert feature allows you to construct your own time-based intervals sessions. 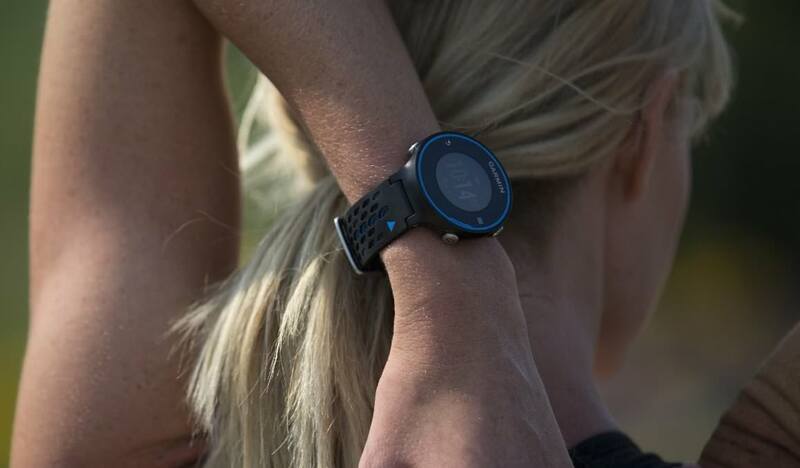 The amount of post-run information presented back to you on the watch itself is really impressive and puts the Garmin streets ahead of other watches like the TomTom Cardio Runner. The app setup for the Garmin Forerunner 620 is pretty straightforward, has the full power of Garmin's Connect platform behind it and comes with a fresh, updated look for 2014. Once you've paired the watch to a compatible iOS or Android device running the free Garmin Connect Mobile app you can view mapping and basic stats immediately, and also upload the data to your Garmin Connect profile. You can also set up nominated Wi-Fi hot spots where the Garmin Forerunner 620 will automatically sync with Garmin Connect when in range. Garmin’s Connect is a powerful beast (Garmin’s pro cycle teams use a slightly juiced-up version) and the social sharing functionality is strong indeed and packs-in live tracking, which allows your friends and fans to follow along and see your stats in real time. You’ll need to invite them personally though, which is a nice privacy touch. There is also a variety of free training plans to follow, and you can create a calendar of activity and have that synced with Outlook and Google Calendar. However, if Garmin’s software products don’t suit for any reason, the Garmin Forerunner 620 outputs data files in the standard .FIT file format, so you can take them and upload to almost any third party site. You’ll need to connect the Garmin Forerunner 620 as a USB device and download the data manually. This is easily done, as the device appears as a standard USB mass storage device. The Garmin Connect app is fully customisable, allowing you to add tiles featuring information from your latest runs plus other Garmin devices like the Garmin Vivoift and even MyFitnessPal for more insights into your diet and calorie intake. In truth, we found the run data on the app lacking a little bit of depth. For brief analysis it’s solid but in order to review all those running dynamics stats, you’ll need to hit the Garmin Connect website. Needing a connection to review your data via the app is also frustrating. In testing we got a solid 10 hours activity tracking out of the Garmin Forerunner 620, but it’ll run as a regular watch (with GPS disabled) for six weeks. There’s also a very nifty autolock function that prevents the Garmin Forerunner 620 slipping back into GPS mode and burning through the battery by accident. The Garmin Forerunner 620 is without doubt one of the most specialised running watches on the market, and offers a gigantic spec list. It’s so configurable that setup can be time-consuming, but once done it’s one of the best around. GPS is quick, accurate and the hardware rugged enough to deal with everyday life.